Riddle: What recipe requires bread, isn’t made with bread, but is served inside bread that is eaten? Luckily we’re terrible at keeping secrets, but quite the opposite when it comes to mouthwatering recipes. 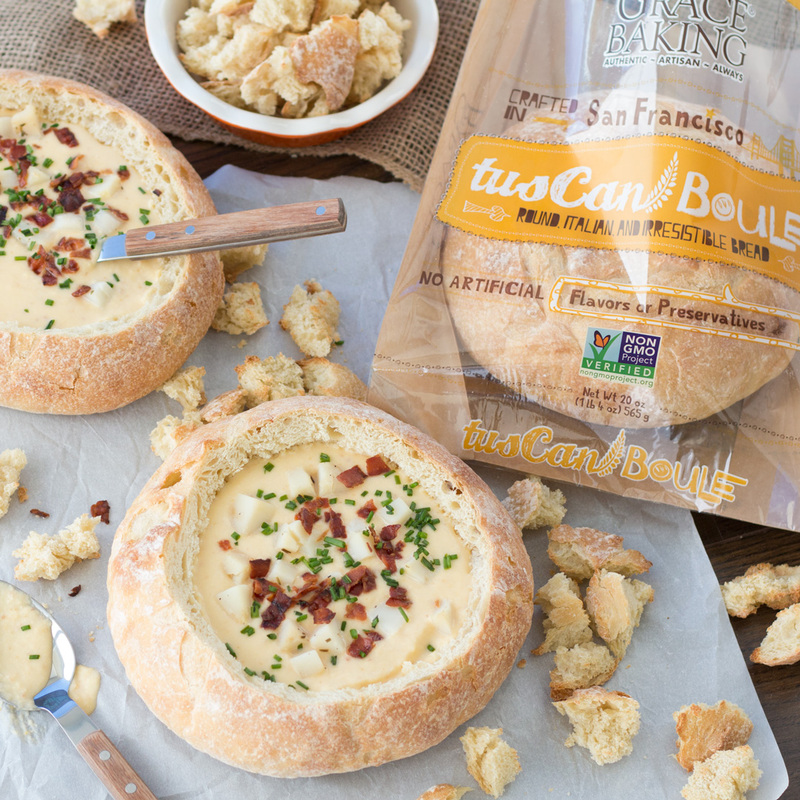 Our Potato Beer Cheese Soup is one of them… part comfort-food, part palate-pleasing spectacular – it combines temptingly traditional beer soup, cheese, and yummy bacon bits served inside our truly wonderful Tuscan Boule. How else are you ever to enjoy a hearty stick-to-your-ribs soup served up in a hollowed-out bread that food critics have universally hailed as “taste-a-licious? Preheat the oven to 400°F. Cut the top off the boule and hollow out to create a bowl. Cube the removed bread and reserve for dipping in the soup later. Place the potatoes on a foil-lined baking sheet and roast for 20 minutes. While the potatoes are roasting, start the soup. In a large pot over medium heat, add the butter, onions and garlic, and sauté for 3-5 minutes. Transfer mixture to the blender, add one cup chicken broth and puree until completely smooth. Return mixture to pot, add the remaining broth and 24 ounces of beer. Bring to a boil over medium heat. Add both shredded cheeses, cornstarch and cream cheese to the pot. Whisk slowly until soup is completely smooth and slightly thickened, about 10 minutes. Remove potatoes from the oven and add to the soup right at the end. Fill hollowed-out boule with soup, sprinkle with crumbled bacon and chives and serve with reserved bread cubes.